"Spider-Man" is one of the most important comic book movies ever made. 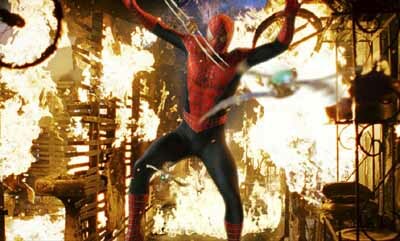 As of this writing "Spider-Man" holds the record for making the most money on a three day opening weekend, it was loved by critics and audiences everywhere, the special effects were nominated for some Oscars, and "Spider-Man's" success paved the way for more comic book movies to be made including "Daredevil," "Hulk," "The Punisher," and the upcoming "Batman: Beginnings." We're only a few days away before "Spider-Man 2" comes to theaters to wow audiences yet again, so I decided this would be a perfect opportunity to take another look at the movie that started the comic book movie trend back up again. By now everyone knows the origin of Spider-Man; nerdy Peter Parker gets bitten by a radio-active spider and wakes up to discover that he has spider powers. This includes super strength, being able to climb walls like spiders, and spinning webs. For awhile Peter uses his spider powers for personal gain in the real world, but one night he lets a killer run by him (and makes no attempt to stop him), and in return the thankful jerk ends up killing Peter's Uncle Ben. Feeling that the death of Uncle Ben was his fault, Peter decides from then on to help other people with his powers. Because as Uncle Ben once said "With great power comes great responsibility." That's how the comic book started out, and the first 35 minutes of this movie follows this origin faithfully. Shortly after Peter Parker makes a name for himself as "The Amazing Spider-Man" trouble arises. Peter's best friend Harry Osborn, who is the son of famous scientist Norman Osborn, who is also happens to be the president of Osborn Industries. Norman Osborn's problem is with a new project he's been working on for a long time. His glider suit that he's been developing for the military isn't coming along as well as he would have hoped, and the shareholders are asking for Norman to resign and leave the company he founded. Well this doesn't make Norman happy, and that night he vows to finish the glider suit and prove all the shareholders wrong about him. However that night something goes terribly wrong (as if you were thinking this experiment would be a complete success), and before you know it Norman finds that he has a Dr. Jekyll/Mr. Hyde persona all of a sudden. With his new Mr. Hyde persona and a line of highly dangerous weapons at hand, Norman puts on his suit, calls himself the Green Goblin, and goes out in the town to take revenge out on all his enemies. Meanwhile Peter has some problems of his own. Turns out Harry Osborn has started to date Mary-Jane Watson, who Peter has been in love with since he was in high school. Not only that, but Peter's new job is to take photo's of Spider-Man for The Daily Bugel, who's newspaper manger Joanna Jamison hates Spider-Man, and Joanna takes every opportunity he can get to make Spider-Man look like a criminal in his newspaper. What a life huh? Well it gets worse. 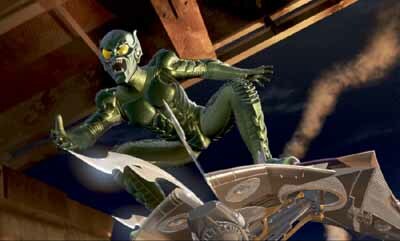 The Green Goblin (after seeing Spider-Man in action) decides that Spider-Man would make a great partner-in-crime, and so Goblin starts to turn the city against Spider-Man. The movie asks a lot of questions that we already know the answers to, and quite frankly the way the story plays out turned out to be exactly how everyone expected it to turn out. However that doesn't stop this from being a great movie. From the acting, to the action, to the music, to the way the story plays itself out, everything was handled with great care. Toby Maquire is excellent as the nerdy Peter Parker, giving us the feeling that while Peter may be one of the nicest guys on the planet, he sure ain't much of a socialist. Kirsten Dunst is also a very decent Mary-Jane Watson, giving the role just enough wits and emotion to make us believe that the character is real. However the show stealer in this movie just happens to be Willem Dafoes portrayal of Norman Osborn. Now as the Green Goblin Dafoe doesn't do anything new or original. After all, anyone can put on a green metal suit and fly around town screaming his head off while throwing bombs. However when Dafoe takes off the makes has a conversation with his alter ego in the mirror, the acting is incredible. He manages to truly create two different characters, with two different personalities, but using only one body. I know it sounds strange, but Dafoes acting is so good in these scene's that it makes some of the other actors look like a bunch of chimps in comparison. It may also be worthy to note that this movies special effects were also nominated for some Oscar's, and while the CGI Spider-Man sometimes looks a little too much like a cartoon it's still great stuff. Overall the secret behind this movies success was not because it was very original or breath taking. No, it's successful because it's just plain fun. "Spider-Man" has just the right amount of comedy, action, and drama to keep the movie moving along at a nice smooth pace while still being very entertaining. Here's hoping "Spider-Man 2" is just as good as this one. Parents, there are a couple strong curse words, but no sexual content and the violence is very stylized. Recommended for ages 8 and up.